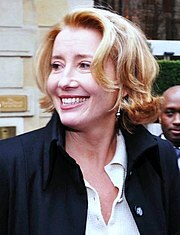 Dame Emma Thompson DBE (born 15 April 1959) is a British screenwriter, actress and comedian. She was born in Paddington, London, the elder daughter of Eric Thompson and Phyllida Law. She was raised in West Hampstead. Her sister is Sophie Thompson. Thompson has a Master of Arts degree from Newnham College, Cambridge. She has won many Academy Awards for her acting. Her many movies include the Harry Potter franchise and the Nancy McPhee series. She has also won many BAFTA Awards. Thompson was married to Kenneth Branagh from 1989 until they divorced in 1995. She has been married to Greg Wise since 2003. Wikimedia Commons has media related to Emma Thompson. This page was last changed on 7 November 2018, at 23:49.